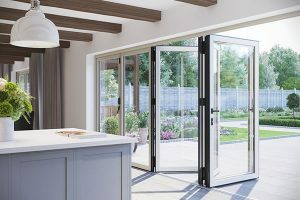 Patio doors and French doors are incredibly versatile, making access to your garden or patio easier than ever and are ideal to bring more light into your home. Made from high quality uPVC, aluminium or timber, these doors are perfect for providing easy access to your garden or your patio area. All our single, double and sliding patio doors require very little maintenance and will add value to your home. White uPVC patio and French doors are one of the most popular additions to a kitchen or conservatory, but our doors are available in a range of attractive colours. Made from quality uPVC, our patio doors achieve high levels of energy efficiency and are affordably priced. Our high quality uPVC doors can be coloured in a range of woodgrain effect foils, for a classic timber look. Aluminium doors feature a heat saving thermal insert, which makes our doors some of the most energy efficient around. These slim and attractive doors can be coloured in any imaginable colour and can be combined with your choice of hardware. Our modern timber doors are made to measure for an exact fit in your home. Timber patio doors are elegant and attractive, and ideal for period properties. Our patio and French doors are incredibly secure and can achieve ‘Secured by Design’ accreditation if required, giving you extra peace of mind about the security of your home. We source high energy performance patio doors to reduce heat loss and save you money on your heating bills. Our large glass doors feature smart solar glass to retain heat from the sun. As well as door colours and glazing, you can choose from a large range of handles and other accessories.